At some time in our lives, we were all privileged to be part of the Calivil United Football Netball Club. For many of us, our experience with this great club has helped shape our character, our values and forged lifelong friendships and bonds that are as enduring today as they have ever been. As a way of keeping connected and a practical way of supporting those who have the day to day responsibility of ensuring the flags keep flying at the CUFNC, a past players and supporters club has been formed. Our past footballers and netballers should not just be part of the history of the club, they should be part of the future, socially and financially. Here is our chance to help balance the ledger. Every dollar that we can raise for the club is a dollar that the volunteers of the club don’t have to chase to keep the Club vibrant. But it’s more than that……………..
We want to provide an opportunity for past players and supporters to connect, to relive past glory, to remember, to reflect and to celebrate our shared experience. We also want the current day netballers and footballers to understand the community that they are part of. We plan to do this through an annual “past players and supporters day” where every past player and supporter is welcome and encouraged to attend the day. - So what does your Demon Supporter membership include? - Ticket for each member in the Demon Supporter’s Club raffle (1st prize- family holiday to Corowa by the River, an amazing house, river frontage and plenty of room for the family, valued at over $2000 and donated by new sponsors, and past player, Carol and Terry Crawford Funeral Services. and will be drawn at the above game. The Demon Supporters Club membership for 2017 will be $75 or $120 for a couple. If you find yourself in a position to contribute more, you can nominate the amount of your choosing, knowing that every dollar will be well spent. To pay your membership this year could you please forward a cheque or make your payment into the following bank account with your name as a reference. It would also be appreciated if you could send an email to ensure your home, mail, mobile and email contact details are updated. 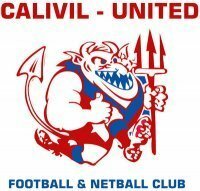 Calivil United Football Netball Club Inc.
Alternatively, if you are contemplating the purchase of a 2017 club membership please find full details on the club’s face book page or contact one of the office bearers. If you can forward this email on to as many past supporters and players, both netballers and footballers it would be appreciated. It is a constant challenge to ensure contact details are kept up to date. All queries or ideas for the Demon Supporters Club are welcome, please contact one of the above office bearers to discuss. PAGE SPONSORS for the CUFNC 125yr historical book are still required. We are calling upon all players and members, past and present, to consider sponsoring a page in the Book. We have had a great response but would like to hear from Netballers, Footballers, Supporters and Members.